MINNEAPOLIS — Lynx star Maya Moore said she’s routinely asked if she has room for all of the awards she’s won in her basketball career. She’ll have to make space for another trophy after her performance on Saturday. “Thank you for your concern for my storage space,” Moore deadpanned after she was asked the question again after she scored 18 points, grabbed eight rebounds, and dished out six assists to win the MVP award on her home court. 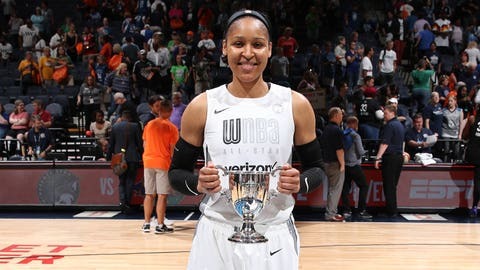 “It’s crazy, it really is, to just be fortunate enough to continue to be in positions to win, to be playing well, to be healthy,” said Moore, who joined Lisa Leslie as the only three-time MVP of the game and became the all-time scoring leader in All-Star history, passing Tamika Catchings’ mark of 108 points. Team Delle Donne’s Kristi Toliver of the Washington Mystics led all scorers with 23 points, including 7-for-11 shooting on 3-pointers. Rookie A’ja Wilson of the Los Vegas Aces added 18 points. Toliver made five 3s in the final 5 minutes of the game as Team Delle Donne came back from a 14-point deficit. But Moore drilled a 3-pointer of her own with 1:26 to play, pushing Team Parker’s lead to six and all but sewing up the MVP award. Quigley beat a field of six participants to win her second straight WNBA Three-Point Contest at halftime. After she and McBride tied with 18 in the head-to-head finals, Quigley caught fire in redo, scoring 29 of a possible 34 points and sending the crowd — and the sidelines — into a frenzy. “I was going to pull up and take a 3, but Candace said I should dunk it so I did,” said Cambage, a 6-foot-8 post who set a WNBA single-game scoring record earlier this year with 53 points. With talk of adding a skills contest to next year’s festivities, Quigley playfully suggested Cambage push for a dunk contest, a suggestion that the gregarious Australian shut down instantly. “Girl, I’m getting old now. I’m not in my early 20s (anymore),” said Cambage, who turns 27 next month.